Suunto Kailash checks your location every 10 minutes to update your time, position, and 7R statistics. In normal day-to-day use, this interval is enough to provide you good travel details while maximizing battery life. There are occasions, however, when you may want even more specific details, such as going out for the morning run in a new city or hiking through the local national park. The activity mode uses high power GPS and GLONASS with one second fix interval to give you a more precise track for navigating parks and city streets, as well as increases the accuracy of your 7R statistics. GLONASS is only used in activity mode. Normal tracking for 7R statistics uses GPS. To start the activity mode, simply keep the 7R button pressed. You can change the bottom row view by pressing the lower button. Press the middle button to navigate to a specific location (see Find back). You can pause and resume the activity mode by pressing the 7R button. To end activity mode, keep the 7R button pressed. With a full battery, you can record about seven hours with activity mode. When activity mode is stopped automatically, the watch notifies you with the message Resuming normal GPS. Alternatively, you can deactivate the activity mode at any time by keeping the 7R button pressed. We recommend deactivating the activity mode if you are going to be in one place for a while, like stopping for a picnic on a hike, to minimize battery use. Every time you use the activity mode, your watch stores a log of the recording in the logbook. 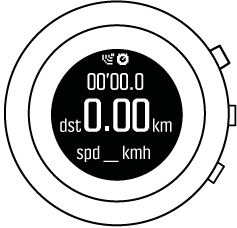 In addition to the time and date, each log shows distance, duration, average speed, maximum speed and average pace. Keep the middle button pressed to enter the options menu. Scroll down to ACTIVITY LOGS with the lower button and press the middle button. Scroll through the list of logs with the upper and lower buttons and select a log with the middle button. Exit the log by keeping the middle button pressed. Up to 100 logs can be stored in the logbook. When the logbook is full, the oldest logs are overwritten first.